Comments: Breeding Snowy Egrets have plumes on their head, chest and back. They are small and white, most easily confused with immature Little Blue Herons. However, an adult Snowy Egret’s dark legs, yellow feet, dark bill and lack of black on the primaries make distinguishing between the two species possible. Juvenile Snowy Egrets may show yellow-green legs, but they usually have some dark on their forelegs and lighter colored feet. The legs and feet of Little Blue Herons are always a pale, dull-green. Like other species of egrets and herons, this species typically nests in large multi-species colonies. 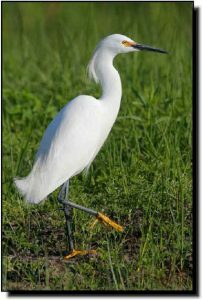 Snowy Egrets are known to walk slowly through shallow water, shaking their bright colored feet to flush fish and other prey. They are only found in small numbers in the northern Great Plains, but are abundant to the south.